This January I went on my first-ever snow camping trip! This is something I’ve always wanted to try out, but I was nervous to do it alone just because, well, snow and cold. Luckily, I have some pretty awesome co-workers at REI who are more experienced than me, planned this trip, and I was able to tag along! So, keep in mind this was my first snow backpacking experience, and I was in a group of 8 people. I’m going to talk about our planned route, my packing list (with some communal gear listed), and some lessons I learned! Hope you enjoy. We started our trip at the Carson Pass Snow-Park on Highway 88, just east of Kirkwood Resort near Lake Tahoe. Here, we crossed the highway and started our trip Northbound on the Pacific Crest Trail. It was nice to visit an old friend on this trip, and I couldn’t believe how different the landscape looked! 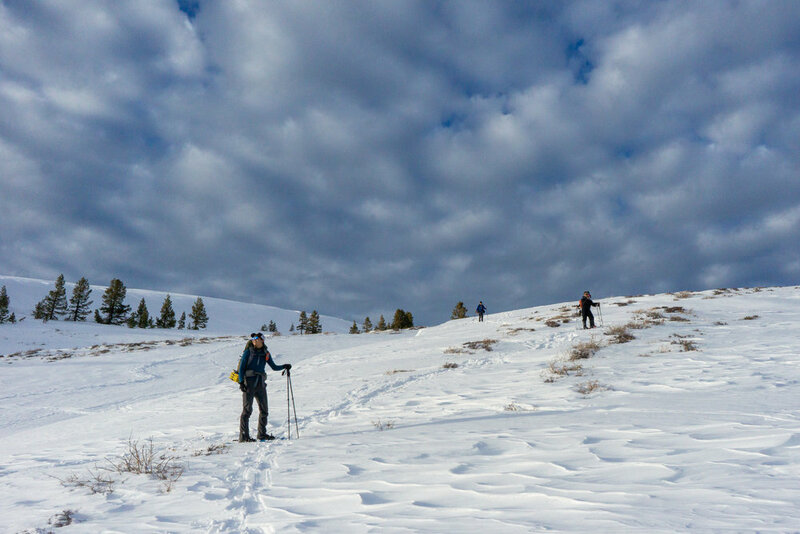 We didn’t really follow the PCT, instead, we immediately climbed up on the ridge and snowshoed about 1.5 miles to the base of a hill that leads to Meiss Meadow and the Tahoe Rim Trail Junction. We initially anticipated setting up a basecamp at Meiss Meadow, after the climb, but since we got such a late start to the day, and because it was super windy and about 20* F, we decided to set up camp at the base of the climb. This ended up being a good idea because we found a pretty awesome sunset spot nearby, had plenty of room around us for building up our camp, and we still were able to day hike up and over the ridge to the meadow on the other side. AKA what the hell did you do for 4 days? On Day 1 we snowshoed out to our camp spot, and set up camp. Thankfully, a group had left before us and there were some tracks in the snow, but we were still kind of breaking trail. It was pretty cold and windy during our hike, which contributed to our decision to end early, along with the fact that many of us had never been snow camping before. Once we got to camp, we stomped out a large rectangle for all of our tents to occupy, and set up our tents. It took me a little while to get the hang of the snow anchors and stakes, but we got our tent up eventually! Dinner time was a little rough since the temps dipped down to the teens and it was windy, the group Whisperlite stove decided not to work, so we were boiling water for 8 people on 2 Jetboils and a Windburner. Not very ideal. Eventually we all got dinner, boiled water for our hot-water bottles and went to bed. Day 2 was a nice sleep-in and chill day. We decided to stay at our basecamp instead of move, so we built up some wind breaks with the snow and our shovels, and built a better path to our bathroom area and built a camp kitchen in a more protected location. We built seats and a table, and basically hung out there all day, talking, and eating! Some of the boys wandered off and found a sweet spot for us to watch the sunset at, so around sunset time, we ventured over there and it was gorgeous! And since the weather wasn’t as bad, we stayed up a little later hanging out at our kitchen. Day 3 was also a sleep-in day, but after breakfast, we got suited up for our day hike over the ridge to Meiss Meadow. It was a nice hike and included lots of trail breaking since it had snowed overnight our first night and other’s tracks were essentially gone. We got to the meadow, made a giant snowman and hung out in the sun, then hiked the 1.5 miles back to basecamp, just in time to change into dry, warm camp clothes and watch the sunset! We then made dinner, and played the Oregon Trail board game that another member brought along. On Day 4, we packed up all of our things and hiked back to the car! We tried to follow the PCT this time, using the GPS, and were breaking trail in fresh snow, so it was slow-going, and everyone was really ready to go eat in South Lake Tahoe. We eventually made it back to the cars, and our trip was over! I was honestly really surprised how much fun was had. I love my co-workers, but there’s always a risk in going out on a 3-night camping trip with people you’ve never camped with before. I didn’t even have to listen to the podcasts I’d downloaded, because we had a blast the whole time! More canister fuel (I ended up using another 8 oz from a friend - for my own cooking and some communal snow melting). Overall, this was a super fun and beautiful trip! I’m making a point to do an outdoors trip/ accomplishment every month this year (2019), and this was a stellar way to kick off the new year, and I can’t wait to go snow camping again.